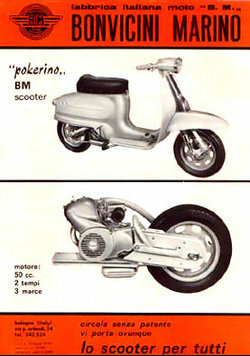 BM (Bonvicini Marino), an Italian motorcycle company, was founded and directed by Mario Bonvicini from Bologna. 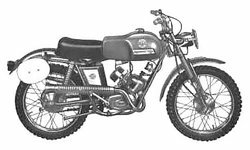 They manufactured, beginning in 1950, a two-stroke motorcycles with a Jlo 125 and 160 cc engine. From 1953 to 1955 the also built different moped models: a 75 cc Luxury model, with a four-stroke engines to four speed tranmission, a 100 cc Grand Touring Luxury four speed and a 250 cc two-cylinder, with distribution through the overhead camshaft and also with a four speed tranni. In 1956 also produces a 48 cc moped, in various versions, the Scooterino a two-stroke, 75 cc, a 150 cc four-stroke, with a four speed gearbox and the Van with 75 cc. In the seventies they produced motorcycles including the Zebretta, the Dai Dai, the Jaguarino Touring, Sport, Cross and Cross Special equipped with a Franco Morini engine, the Velocino with 10" wheels, Gambalesta and the Wally. 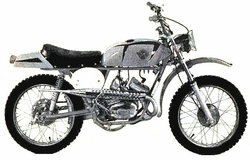 The KS 50 used the Minarelli engine with gear six-speed transmission and front disc brakes. At the beginning of the eighties, the production was limited to a few models, including the Boy Girl Luxury, with a Franco Morini 50 cc engine, the P6 Enduro with the Minarelli engine, the P6 and KS 50th with the same trademark but built by motorcycle builders Baudo and Melde, in the thirties, with JAP engines of 500 cc, three-speed grearbox. In 1931, at the request of a client, they applied for an electric starter motor and certainly this is the first device equipped with sort of device in Italy.